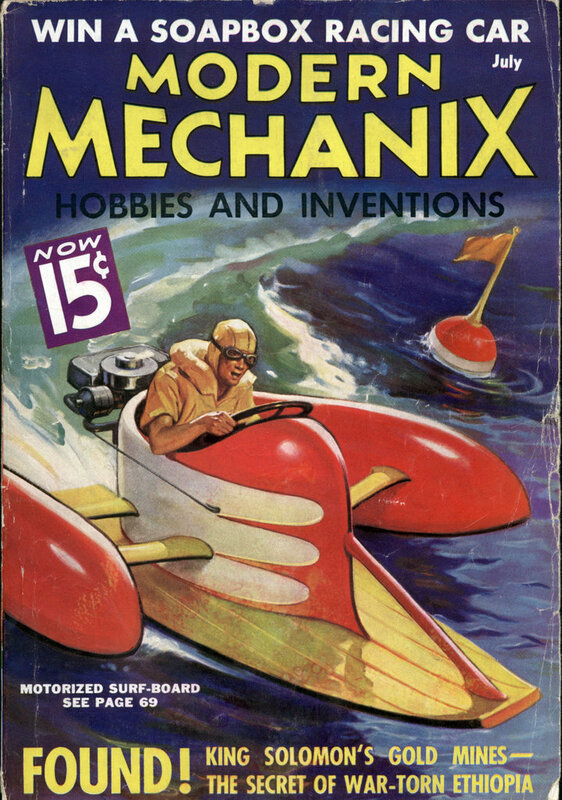 Politics becomes mechanically minded in 1936, and both Republicans and Democrats are providing the machinery which will permit the nation to listen in to the proceedings. THE political machinery for nominating the presidential candidates of the two major parties remains as old as the parties, but in June this year the entire nation will be given ringside seats at the National Conventions at Philadelphia and Cleveland, with both parties taking advantage of every latest scientific wrinkle to bring the conventions to your home or local movie. 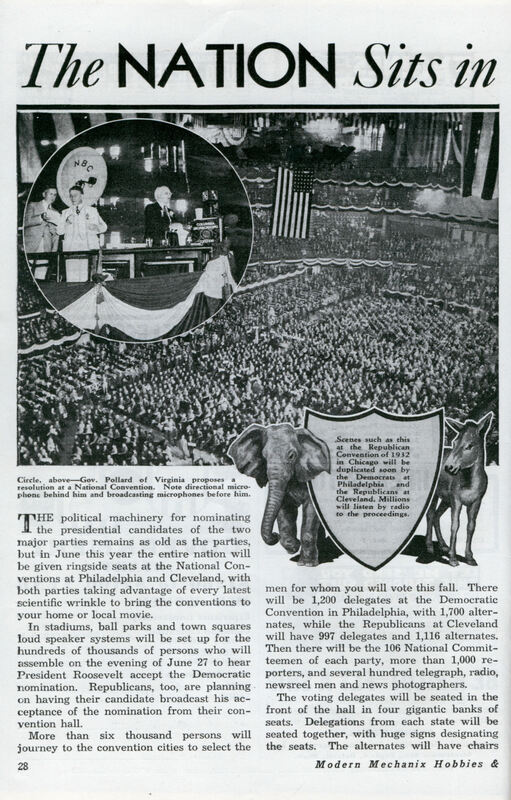 In stadiums, ball parks and town squares loud speaker systems will be set up for the hundreds of thousands of persons who will assemble on the evening of June 27 to hear President Roosevelt accept the Democratic nomination. Republicans, too, are planning on having their candidate broadcast his acceptance of the nomination from their convention hall. More than six thousand persons will journey to the convention cities to select the men for whom you will vote this fall. There will be 1,200 delegates at the Democratic Convention in Philadelphia, with 1,700 alternates, while the Republicans at Cleveland will have 997 delegates and 1,116 alternates. Then there will be the 106 National Committeemen of each party, more than 1,000 reporters, and several hundred telegraph, radio, newsreel men and news photographers. The voting delegates will be seated in the front of the hall in four gigantic banks of seats. Delegations from each state will be seated together, with huge signs designating the seats. The alternates will have chairs on the auditorium floor directly behind the delegates. Aisles between the banks of seats will be especially wide. The speakers’ stand will be an elevated platform erected on the front center of the stage. On this platform will be the Chairman of the Convention and the principal speakers for the day. On this platform also will be the operator who will control the radio and newsreel microphones and the public address system through a maze of 53 switches. From a technical point of view, this switchboard operator will be the most important man in the convention hall, for he will have complete control of all sound effects. It will be he who will, under the direction of the Convention Chairman, sort out the correct speeches from the bedlam created by a thousand men all anxious to talk at once, and to see that the voice of only the speaker recognized by the chair is amplified on the public address system, is broadcast to the nation over the three networks, and is recorded by the newsreel camermen. On the rostrum of the speakers’ platform will be the three microphones of the broadcasting companies. The voice of the regular speakers will be carried directly to the soundproof studios erected over the back of the stage, and from there, over telephone lines, will be carried to the hundreds of broadcasting stations on the networks. The five news-reel companies will also have microphones here connected directly with recording apparatus, while another microphone will amplify the speech so it may be heard in the farthest corner of the hall. So far there is nothing unusual about the procedure. But there are a thousand delegates seated on the floor of the hall, each of whom has the right to speak when he has been recognized by the chairman. Actually, each state delegation has a spokesman, who is authorized to speak for all. Pages Will Carry Microphones Owing to the size of the meeting, it would unnecessarily delay the business of the Convention if every delegate desiring to be heard had to mount the speaker’s platform. To obviate this there will be ten microphones suspended from the ceiling, each mike in charge of a page boy. When the chairman recognizes a speaker on the floor, the nearest boy will bring him a microphone, into which he may speak, while the switchboard operator plugs in that mike to the loud speakers, radio and newsreels. It will be futile for anyone to attempt to shout down a speaker, once he has the exclusive use of all sound facilities. Howard Leland Smith, the architect for the Democratic Convention, has designed a way of taking care of newspapermen that will do away with the complaint that the most favored pressmen had the worst seats. Press boxes at such affairs have usually resembled two huge sections of grandstand, sloping downward toward the center, so that the representatives of the big press associations and largest papers have been directly under the speaker’s stand, unable to see, and often to hear, what is going on. Smith has reversed this arrangement, elevating the center of the press box, and sloping it downward toward the ends, thus enabling all to see and hear. This press box has been placed over the orchestra pit, with press rooms directly beneath. Newsreels Will Be Active Three platforms have been erected for use of the newsreel cameramen. One, a double deck affair, will be at the edge of the stage, so the camera may catch a profile view of the speaker, or may be turned outward to take in the Auditorium floor. Two other platforms will be erected 120 feet from the speaker’s platform, at either side of the hall. The cameramen here will use telescopic lenses. Accredited newspaper photographers taking stills will be permitted the run of the auditorium, mainly because those in charge realize the futility of trying to confine their activities to one spot.